You unfaithful wives! Don’t you know that loving the world is hating God; Whoever chooses to be the world’s friend makes himself God’s enemy! Or do you suppose the Scripture speaks in vain when it says that there is a spirit in us which longs to envy? You see, I really could care less about a house, the things that go with it, I really don’t have my heart hinged on it! I learned a while ago, home by its definition has very little to do with earthly structure. So when the Lord points His finger and says “Go, there, now!” We went, and the doors flew open, then the Lord held up a stop sign, like a cross walk attendant at a school. We sat there and watched the flow of events roll thru our line of sight and scratched our heads. “Were we really hearing from God?” Next came the huge task of waiting. One minute I’m saying; “Hey slow down, Lord!” the next I’m taping my fingers in the “ark” full of boxes and ready to go. But no rain. The tight rope I began to traverse was all about revealing the fine line between demand and devotion, true contentment and spiritual imagery, praise and popular pump ups. After all the there's a difference between waiting for God to move you, all moved in to a place and ready to stay or leave, but. ..unpacked – and ready to leave or stay – packed up. Everything feels competely inaccessible in the latter, but tolerable in the former. Comfort to this flesh I'm in was still handy in the former, not now. I'm not a neat freak, but this is unnerving. I'm tripping over boxes with stuff in it I need but can't undo because at a moments notice I just know, just KNOW the word is coming. .."it's time to go!" And I'll regret taking a step back in obedience to cater to a wavering faith. At one point I told those around me (with a laugh in my voice) "I’m not sure I’m packing out of denial or faith, at this point!” We all giggled, but I meant it. And this is hard. They say buying a house ranks up there in the top three most stressful things you can do. Not sure the order, but getting married is among them and losing a spouse. I’ve been married, not so much stress there. Even bought a house before, that was a cake walk compared to this time around. I haven’t lost my spouse, I don’t have to think long about that to know its definitely worthy of being among the top three. Yet as a Follower of Yeshua, this whole house thing uurks me. It’s a thing, and temporary and distracting if you ask me. I praise God the house was located in another state, so my attachment to it was very small and grew dimmer by the day. Saying “easy come easy go” at this point especially – no problem! Yet deep inside, way down in there, I want the house, I want the heck out of this city, and I’m ready for a change. The house, I could leave or take but now my estimated time of departure hinges on the darned thing! Incompatible, oh yeah, I get that! The One I Follow never had a house. I require shelter, but I dont need to own a house. I can live in what most call pretty undesirable circumstances. The apartment I currently dwell in is far from nice, except that it’s what God has provided, it functions, and I can (barely) pay for it. The amount of money we throw at it would shock you, but it’s ‘the cheap’ here. You get what you pay for? Not in this case, I am staring at alot less dough for that house than this apartment. The house appeals! But the stress to get it so far? I’ll keep the apartment, thank you! Why would the Lord catch me between two winds of such opposing nature’s? My eyes are dry, hair is a mess, and skin is the kind of chapped that can only come from long periods of time exposed to ferocious winds. Tonight, it hits me. The calm begins. ..He’s reminding me what satisfies. It’s not this apartment, a house, the stuff in those boxes, or out of those boxes, order, none of it. It is Him. My flesh argues on many levels while my soul takes its position and digs in. Then Yeshua’s (Jesus) words in Matthew 6:24-25 came to softly shield me in the windswept terrain. He goes on to say the many ways we worry about our lives and the incompatibility of worry and worth in His eyes. The days of Christmas have just passed, full of money money money, things things things. Though we don’t celebrate this holiday, we watch most of our loved ones do so. Or try to. Broke in December always brings new meaning to the word Christmas. Tears flow due to the lack of ability to “give”. The illusion of love wrapped in a shiny package is strong this time of year. It makes one dread the up and coming “new year”. How completely futile! The Lord wasn’t even born in December! And He would certainly never have endorsed a material giving and wanting to get in children on His birthday! It’s completely against everything He ever did or said! Yet, here is the crave Wayne Stiles is speaking of. The best this world has to offer is its comforts and toys. The best His world has to offer is sacrifice and giving of things far more valuable – time! Time full of grace and mercy. Time full of hope for a future that doesn’t include anything you can fit under a tree. Or wrap in a bow. Time spending currency that can’t be earned on earth, only in heaven. Where the only One that can be praised is God! What a strange turn of events these days have uncovered. What can sumerize them best. The quote above and the lens of God’s Word to understand them. We crave. We surrender. We serve. We Follow. We suffer. We obey. We learn. Or we crave, indulge, expect, invade, enjoy temporary comforts at the cost of eternal gain, disobey, and repeat the same mistakes over and over, never learning. Almost everyone does this every December. Almost everyone does this when the opportunity comes to buy a new car or house or anything. What do our opposing cravings teach us? What story will they tell on judgment day? Who’s birth do we celebrate in joining a world in a pagan holiday that originally celebrates the idols born from the beginning of time? No matter what, just like Yeshua said, these thing reveal who our Master will be. The one we love or the one we hate. Both dwelling inside our hearts and mind only create chaos. One must go. It’s not wrong to buy a house. If God tells you to. It’s not wrong to buy anything, if God leads you to. If He does, we don’t have to put off bills or rack more up to do so. He pays for it too! Our jobs are His way of doing so. If He says full spreed ahead, we go. Yet then if He puts the brakes on, we wait. Or we lose Him in the midst of the travel. A far more costly endeavor. 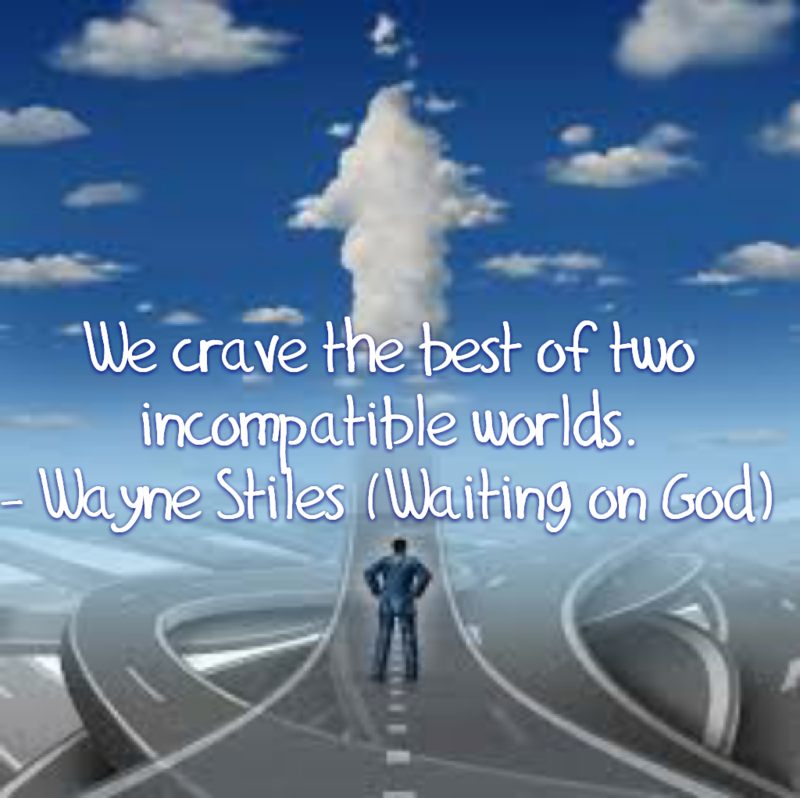 How to discern deep in the craving of two incompatible worlds? Wait on Him, then obey, follow, and trust Him. Our flesh will run us amuck. It is a master deciever, telling us we only want good things while those things scratch out the eyes of truth. We are warned, not to be ruled, but in love. His love is the only thing that puts things of this world in union with His. Compatibility. Thank Abba for this lesson, on going as it is, and carve out in me, only what is solid in You! May You get the glory! Most excellent teaching from Yeshua through you! Thank you for sharing the struggle with me.